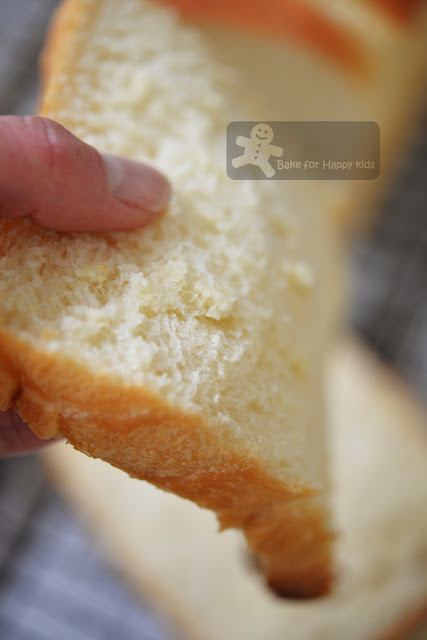 Bake for Happy Kids: Extremely Soft and Fragile Milk Sandwich Bread - So soft like Tofu! 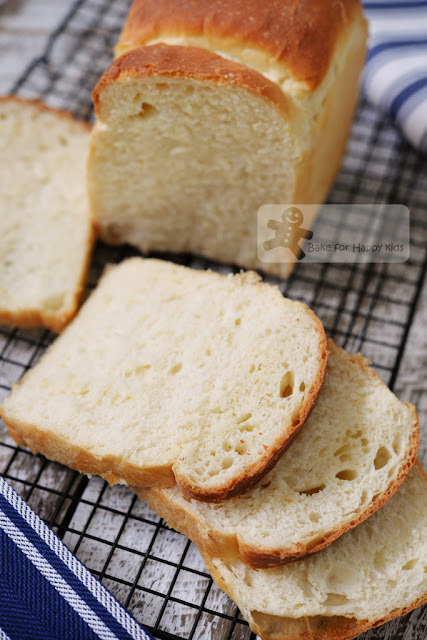 Extremely Soft and Fragile Milk Sandwich Bread - So soft like Tofu! Have you seen a bread that is so extremely soft that it collapses whenever you touches it? 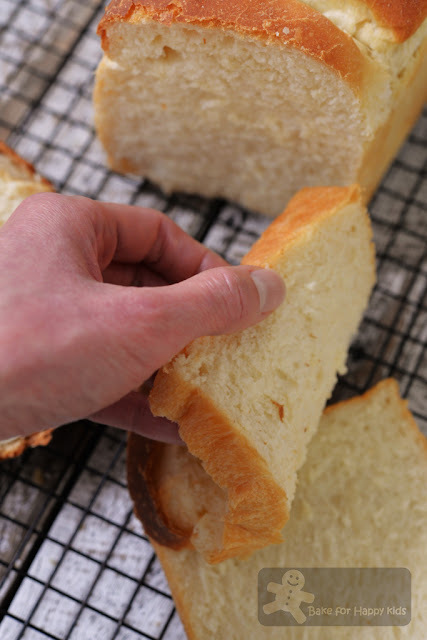 Although it is so deliciously soft, I have to say that slicing this extremely soft bread is extremely challenging!!! So challenging that I was actually in the borderline of frustration... LOL! See! The bread is so soft that it drapes on my hand! Why is this bread so soft like tofu? This recipe from Cookpad uses almost the same amount of milk and flour to bake this bread that is extremely moist and soft. As a result, this bread didn't have a good amount of strength to hold its structure and can be very fragile and easily to crushed when sliced. I'm surprised and amazed to see that the soft dough can rise so well! ... but hate hate hate hate HATE slicing it! ... LOL! Then I discovered another recipe at Cookpad which contains the same composite of milk and flour but substitute 30ml of milk and sugar with 30g condensed milk making the dough and the bread firmer and easier to handle. 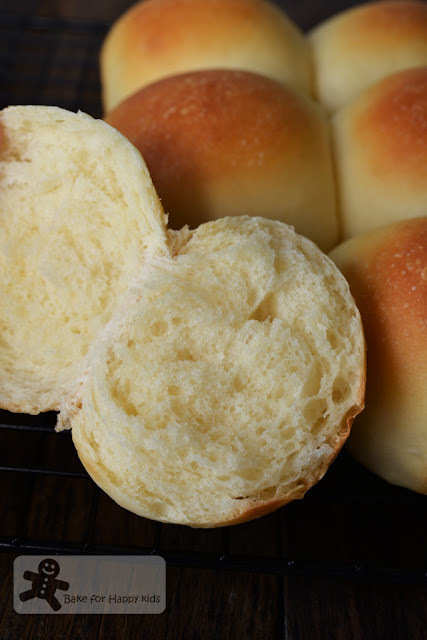 Instead of using this recipe to bake sandwich bread, I have used this recipe to bake pulled apart buns which also helps me heaps by eliminating my frustration of slicing the bread! LOL! Shaping the dough into little rounded rolls. No bushing of milk or egg wash prior baking is required. 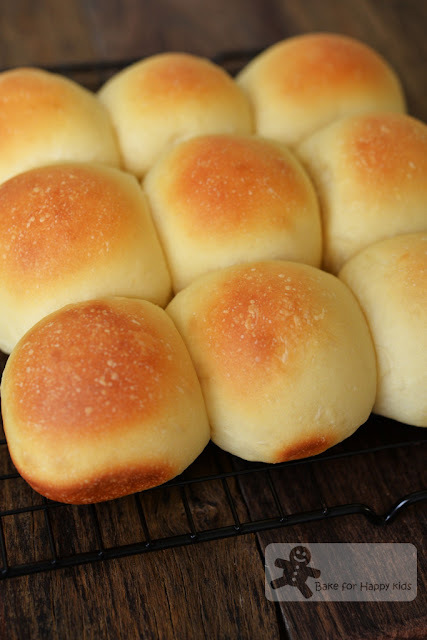 Nice that I don't have to slice these soft fluffy rolls... LOL! ... they are not extremely moist and soft like the sandwich bread! Like the extremely soft and fragile bread? ... but hate slicing it? To slice or not to slice? Oh man, this is too hard to decide... LOL! Eventually, I had to surrender to this recipe! LOL! I really love the softness of the bread so much that I had to bake them again... Then again and again. Here's a one-minute video showing how I baked these extremely soft and fragile sandwich breads again. This time, slicing the breads is not really a problem because I'm an electric knife! Yay!!! Add all ingredients (according to this order, liquid first, dry ingredients, butter and then yeast) into a breadmaker. Using the dough setting, combine and knead ingredients into a smooth and elastic dough and allow it to prove for 1 hr. If breadmaker is not available, kneading by electric mixer with a dough hook is possible. Using an electric mixer with low mixing speed, mix all dough ingredients (except butter) to form a dough first. Then, mix in the unsalted butter and keep kneading at medium low speed until dough is smooth and elastic. Transfer dough into a large bowl and cover it with a cling wrap. Allow the dough to rise for 1 hr or more until doubled in size. Important: This bread recipe uses un-scaled milk and will produce a dough that is sticky to handle and so I would not recommend kneading by hand. Due to the presence of the milk enzymes, the bread might take a longer time to prove than usual. 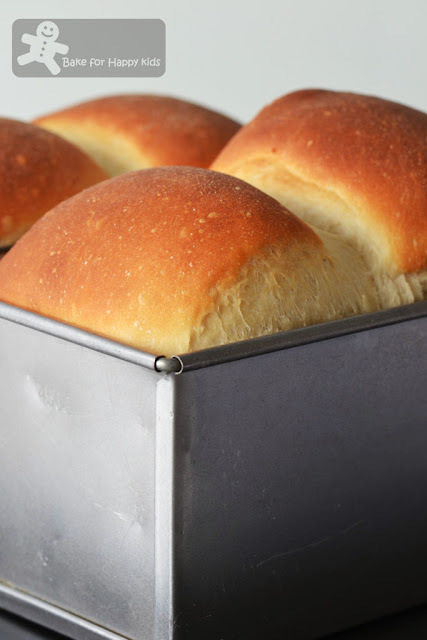 Grease loaf pan or square pan with butter or vegetable oil spray. Using a lightly floured rolling pin, flatten and roll each portion into long and flat oval shape (about 15-20 cm). Use your fingers to pick one shorter side of the dough, tuck and roll the dough like a Swiss roll. 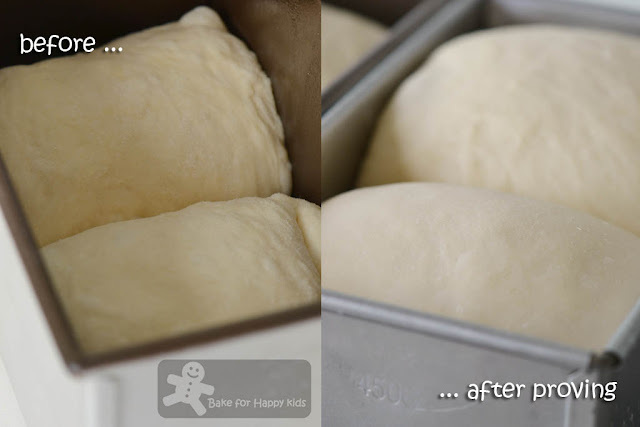 Use a rolling pin to flatten and roll the dough into a long rod shape again. Then, pick one shorter side of the dough and roll it like a Swiss roll again. 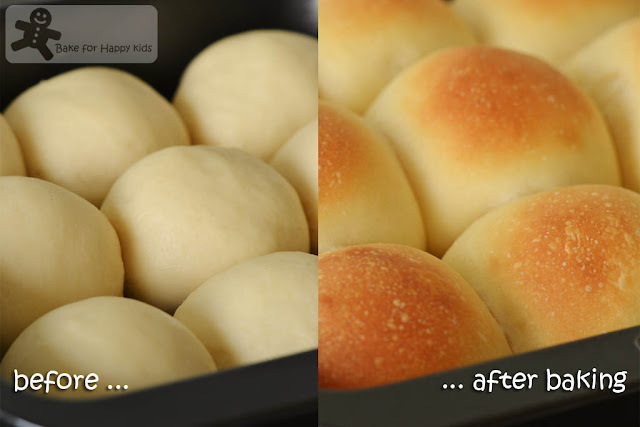 Repeat this rolling step with the remaining portion of dough. Place two shaped dough with their seams side down into the prepared pan. Press the top of the dough lightly to form an even surface. Cover the dough with cling wrap loosely and allow the bread to prove for another 90 mins or until it reaches the top rim of the pan. 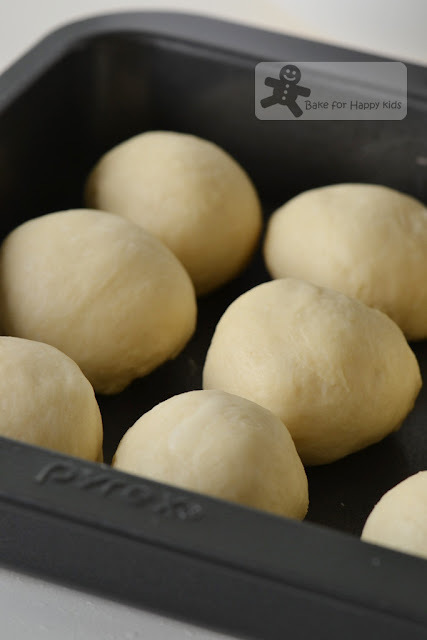 Divide dough into 9 portions and shape each into balls with their smoothest surfaces that you can stretch. Arrange dough with their smooth surface face up into the prepared pan. Allow it to prove for 60 mins in a warm place or until doubled in size. Preheat the oven to 180°C or 160°C fan forced and bake the rolls for 12-15 mins or the loaves for 25-30 mins or until the bread turns golden brown. When the bread is baked, unmould the bread immediately. Transfer bread on a wire rack to cool completely. Slice or pull and serve.